Experience all that Melbourne has to offer at the stylish Sofitel Melbourne on Collins – the city’s highest hotel with jaw-dropping views – located in the heart of the shopping and dining district. Spend a luxurious weekend in a prime location and enjoy Club Sofitel access with exclusive benefits, AU$50 credit to use at the hotel’s No35 restaurant, daily breakfast, nightly pre-dinner drinks and canapés, valet parking and a leisurely 2pm check out. This five-star getaway will see you staying right in the heart of Melbourne’s premier CBD precinct, Collins Street. Located on the ‘Paris end’ of this prestigious street, Sofitel Melbourne on Collins is just a short walk away from practically everything. From high-end fashion to hatted restaurants, famous theatres to rooftop bars, the best of Melbourne is at your doorstep. Want a sneak peek inside the hotel? Then Come With Us to Melbourne’s Highest Hotel. Step outside the hotel door to discover stylish, arty Melbourne. There’s literally something for everyone in this incredible city. Shop your heart out on Collins Street and Bourke Street. As for dining and entertaining, Melbourne definitely has you covered: venture down Little Bourke Street to discover Chinatown, explore all of the city’s famous laneways, which will almost always lead you to secret cocktail bars and impressive restaurants, or head to the Melbourne Arts Centre for a night of ballet and arts. 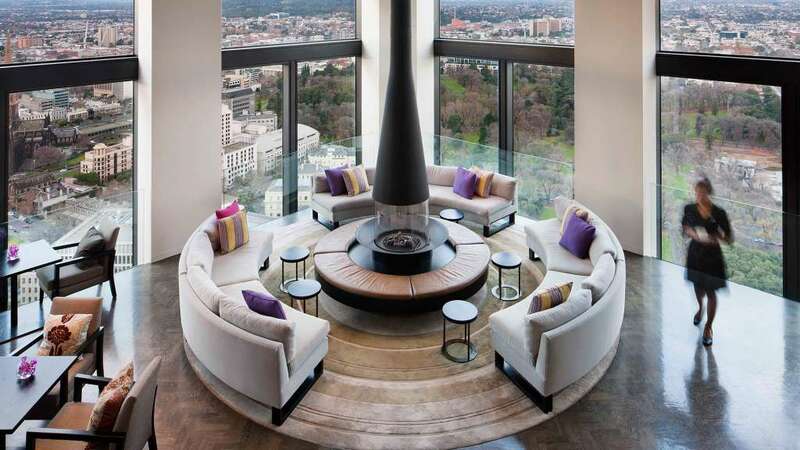 Skip the queue at reception and head straight to level 35 for private check-in at Club Sofitel. Your spacious, finely decorated, 36sqm room awaits on the higher floors (47th floor and above) of the Sofitel Melbourne on Collins. Featuring a marble bathroom, king bed and stunning views of the city, extensive minibar offering, Nespresso machine and tea menu, you will love every minute of your stay in your Luxury King Club Sofitel Room. Celebration Upgrade: Special birthday or anniversary coming up? Upgrade your stay to an elegant and sophisticated Prestige Suite – 77sqm of pure luxury, boasting the best panoramic views of the city and the bay. Located in prestigious corner positions, between levels 36 and 49, your two-room Prestige Suite is the ideal place to unwind after a day of exploring the city or catching a show. Plus, with a late check-out at 2pm, you can make the most of your last day in the city. If you’re driving to Melbourne, Sofitel Melbourne on Collins has you covered with valet parking included – so you really don’t have to worry about a thing. Enjoy a buffet breakfast overlooking the city. Feast on your favourite continental dishes such as bircher muesli, a selection of breads, wellness juices and fruits as well as selected a la carte items. Toast to your escape with pre-dinner drinks and canapés each night of your stay, and enjoy an AU$50 voucher for No35, the hotel’s stylish restaurant. Located on the 35th floor of the building, the restaurant serves modern cuisine using fresh local ingredients matched with attentive service and an outstanding wine selection. Go for a stroll through the city’s laneways: AC/DC Lane, Flinders Lane and the famous Hosier Lane are all a short stroll from the hotel. Melbourne’s sports scene is also waiting for you – book a ticket to the Melbourne Cricket Ground for a footy match or, if you are more into arts and culture, nearby Her Majesty’s Theatre & Regent Theatre play host to the latest theatrical offerings. For foodies, Melbourne’s eclectic dining scene offers an impressive array of cuisines that will leave you speechless. Down dumplings in Chinatown or hop on a tram out of the CBD and discover the city’s other top eating and drinking destinations: Richmond for Vietnamese, Carlton’s ‘Little Italy’, St Kilda for a cocktail on the beach, or Fitzroy for a rooftop drink overlooking the city.